Keeps dogs of all ages safe and contained with the Design Studio Metal Walk-Thru Pet Gate. The Textured Graphite finished frame with cherry finished inset adds style to any home. The gate's easy-to-adjust pressure mounting system makes installation quick and easy. Features an Auto- Close walk-thru door. Fits openings up to 37.5" wide, with included 4" extension. 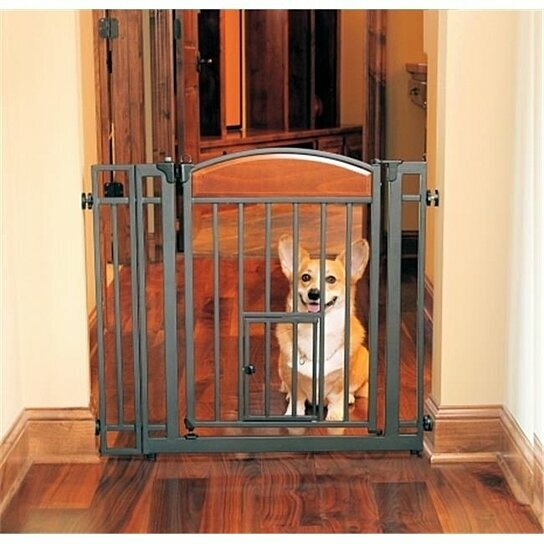 Small pet door allows pets to pass freely (9.5"T x 8.75"W). Tough, durable all-steel construction is "chew proof".